Ever hear a faint, plaintive whimper coming from the frozen food aisle when shopping at your local supermarket? That soulful sound is the cry for more low-sodium options among the wide array of frozen foods and brands. Fortunately, the innovators at Amy’s Kitchen have heard the call and answered with two new low-sodium, organic products: Light in Sodium Burrito and Light in Sodium California Veggie Burger. The Light in Sodium Bean & Cheese Burrito and the Light in Sodium Bean & Rice Burrito feature an organic flour tortilla wrapped around organic pinto beans, rice and vegetables in a mild Mexican sauce. The Bean & Rice Burrito is a non-dairy option. Suggested retail price for each 6 oz. burrito is $2.69. 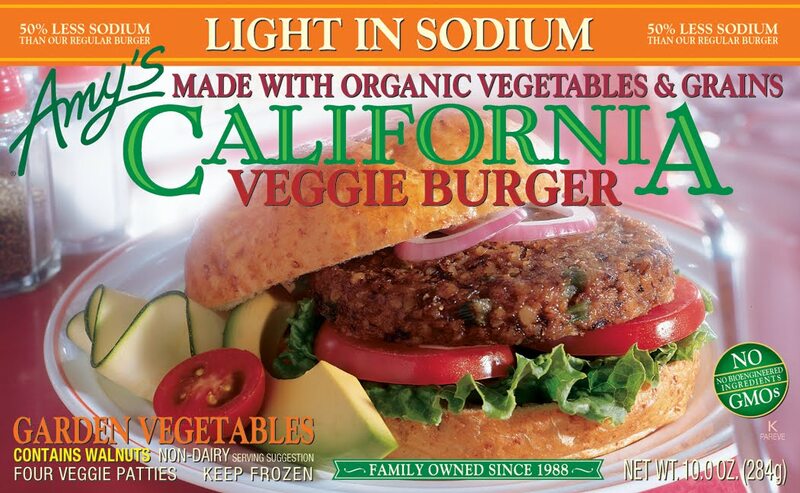 The Light in Sodium California Veggie Burger is a blend of organic grains, mushrooms, vegetables and walnuts, and contains only half the sodium of Amy’s regular California Burger. A package of four veggie burgers (about 2.5 oz. each) retails for a suggested price of $5.79. TFFG Says: The incidence of high sodium levels in processed foods has long been a concern of nutritionists and wellness advocates, so it’s good to see Amy’s rolling out these low sodium options. The Frozen Food Guy is a regular buyer of veggie burgers, and he has been concerned that longstanding brands have suffered from “nutrition level” creep the last few years. These brands have shifted their veggie burger products from just 1 gram of fat per serving up to 2.5, 3 and sometimes even 4 grams of fat while the fiber levels have been reduced. Check your labels closely as the “all vegan” and “California” veggie burgers can sometimes have twice the fat of a “garden veggie” or vice-versa based on whichever manufacturer makes that particular brand. Don’t be fooled by the package front, not all “veggie” products are the same. Contrast and compare the nutrition levels listed on the back of the package for fat grams, fiber grams, calories and sodium content levels.